This year marks the 10th anniversary since Pace Gallery first began working in Asia—and what a decade it’s been. Pace, which was founded by Arne Glimcher in Boston in 1960 and now has outposts around the world, opened the doors to its Beijing space in 2008, expanded to Hong Kong in 2014 and then earlier this year opened its second space in the city, this time in the H Queen’s art hub. 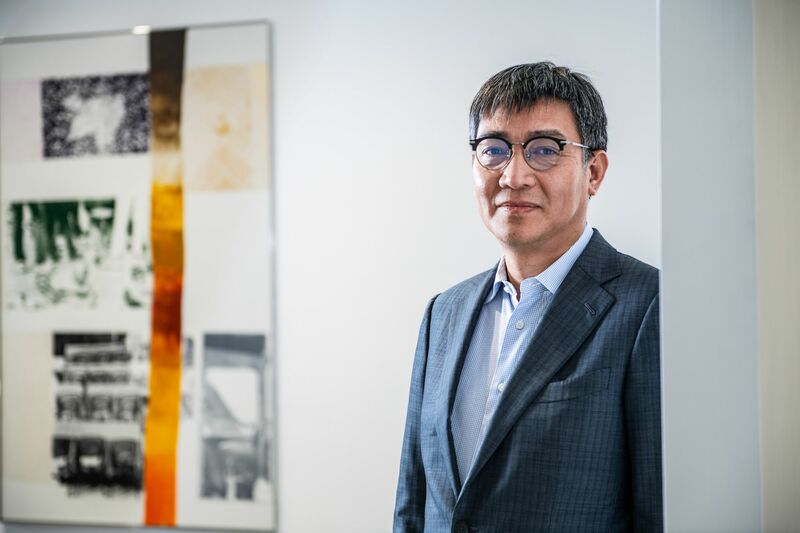 Leading Pace in Hong Kong and Beijing is Leng Lin, who has organised exhibitions in Hong Kong of both leading international artists—among them Yoshitomo Nara, Robert Rauschenberg and Alexander Calder—and rising stars such as Loie Hollowell and Qiu Xiaofei. Zhang Xiaogang’s "Big Family" from his Bloodlines series. In 1985, I saw Zhang’s work for the first time when I was a university student in Beijing and was immediately impressed. In his work there is a quiet, simple but deep mood that always moves me deeply. In 1997, when he had a solo exhibition in Beijing, I met him in person. After he moved to Beijing, we got along very well, and I held his first solo show in New York in 2004. The exhibition helped me get to know him even more and understand his method of painting. Then I started representing him in 2004, when Pace presented new works in his solo exhibition In and Out. What was the first exhibition you ever hosted? My first exhibition was New Anecdotes of Social Talk in 1995. I invited Liu Ye, Zhang Gong and Hong Hao for this group show. I tried to set some new challenges and put together a new exhibition which was different from political pop and cynical realism, which was common in China at that time. I wanted people to look back on Chinese contemporary art and see a variety of different styles. Beijing Voice: Together Or Isolated was the exhibition I hosted after I joined Pace. At that time, Chinese contemporary art was in the midst of an obvious change, where artists had built up more confidence about their own culture and weren’t afraid of showcasing it, whether it was from a social, ideological or political view point. Liu Ye. We have had several spiritual conversations, which reflect his love for reading, his creation and thought processes. His first show in China was the New Anecdotes of Social Talk show that I mentioned earlier. Since then, I have kept in touch with him. He is not a productive artist but spends a lot time reading, thinking and experiencing. As a figurative painter, his understanding of forms is very impressive and can effortlessly collaborate extreme element of forms into allegorical figures. We have been good friends for a long-time and discuss many things together. I don’t know why we have never talked about representing him. Maybe we just have to wait for the right moment. Hong Kong’s art scene is so vibrant with such a diverse list of galleries, both local and international, as well as a great selection of museums and art centres and cultural institutions. I also feel Hong Kong artists are sincere and willing to communicate. Even though the number of artist isn’t as high as in other places, you can feel an exciting atmosphere here that is changing rapidly. What’s the worst thing about the art scene in Hong Kong? It has to be the rent. It is challenging to find enough space, whether it is for showing or creating art. Who is the most recent artist to join Pace and what excites you about their work? Loie Hollowell is an exciting recent addition to the gallery roster. When I was working on an exhibition at Queens Museum in New York, she was working there; now, she presents her work at Pace and I work for her. Which exhibition are you hosting next at Pace? This month we're opening a show by Nigel Cooke in Hong Kong. I'm also working on a show by Li Songsong at Pace Gallery in New York that will open in 2019. As a representative artist of Chinese contemporary painting, Li Songsong has won widespread attention for his unique and distinctive style. Next year, at our Hong Kong space in H Queen’s, we will present a solo exhibition of works by American sculptor Alexander Calder. I wouldn’t miss the Venice Biennale. I would have to say Song Dong. From the first time I met him, I felt that in our relationship it was him representing me, instead of the other way around, which is a representation of the kind of person he is—warm and open to the different angles of beauty in the world. His determination, encouragement and interaction towards people is unbelievable. I have known him for almost 30 years and am proud to say we have a solid relationship. This relationship encourages me to extend that to every artist I work with.